Travelling to Genets Carp Lake. Driving in France is generally very easy & the roads usually much less congested than UK roads but you do need to be aware of certain travel requirements, documents to carry and basic information particularly when driving. Click here for full information. Once your holiday is booked & paid in full we will send you a set of driving directions from your chosen French arrival port plus Sat Nav coordinates which will bring you right to our gates at Genets carp lake. If using Sat Nav please be careful when entering coordinates. Entering just one digit incorrectly can take you many miles out of your way. It's always a good idea to carry a map & cross check you’re heading in the right direction. AFerry Homepage AFerry offers all routes to France, allowing you to compare ports, prices and times for cross channel ferries and Eurotunnel. P&O Ferries have up to 23 sailings a day from Dover to Calais with just a 90 minute crossing time which means you can be very flexible with your travel times. Driving time from Calais to Genets is approx 5 hours. Brittany Ferries offers a range of ports and routes to take you closer to your Carp fishing holiday. Choose the most convenient route for you and save time with a shorter drive to Genets lake. Driving time from Caen to Genets lake is approx 2 hours. No tolls to pay. Portsmouth to St Malo is a popular choice for a relaxing cruise sailing direct into Brittany where you'll find first-rate accommodation, dining options and facilities. Sailings depart from Portsmouth in the evening for a pleasant and relaxed overnight journey. Return sailings from St Malo leave France mid-morning for a comfortable cruise experience back to the UK. Driving time from St Malo to Genets lake is approx 1hr 35mins. No tolls to pay. Portsmouth to Cherbourg provides perfect crossing options for passengers travelling from London and the South who want to get to France fast. Sail on the fast-craft the Normandie Express and get to Cherbourg in just 3 hours. Driving time from Cherbourg to Genets Lake is approx 2hrs 20mins. No tolls to pay. Portsmouth to Le Havre is perfect for those travelling from London and the South, setting sail to Le Havre on Britanny ferries overnight economy service crossing. Driving time from Le Havre to Genets Lake is under 3hrs. Plymouth to Roscoff Daytime sailings take 6 hours and an overnight crossing with a comfortable cabin takes 8 hours. There are up to two sailings per day at convenient times for a relaxed, enjoyable journey and a great start to your carp fishing holiday. Driving time from Roscoff to Genets lake is approx 3 hrs. No tolls to pay. DFDS Seaways offer 3 routes, Newhaven to Dieppe a 4 hour crossing, Dover to Dunkirk a 2 hour crossing & Dover to Calais a 90 minute crossing. Eurotunnel If you prefer not to travel by ferry there is the option of the train with Eurotunnel with just a 35 minute crossing time and up to 4 departures per hour. 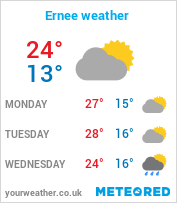 Keep up to date with the weather for Genets Lake.